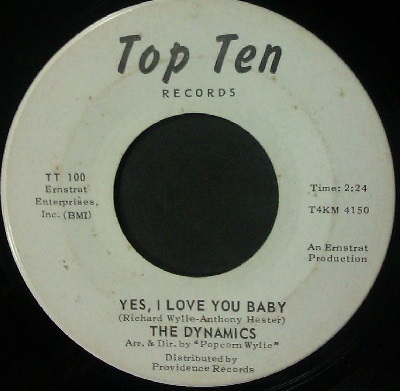 Recently passing through the Soulmine to a collector was this lovely and rare white demo of the Dynamics "Yes, I Love You Baby". There are thought to be just three different types of demo , two from the East Coast and one from the West Coast of America. The two east coast records are plain white , one with 'Top Ten' in 'block' letters and the other printed in italics both on vinyl. The west coast version has two black lines printed across the center of the record and is styrene. The only known issue is from the west coast , is pale blue with the same two lines as the demo.